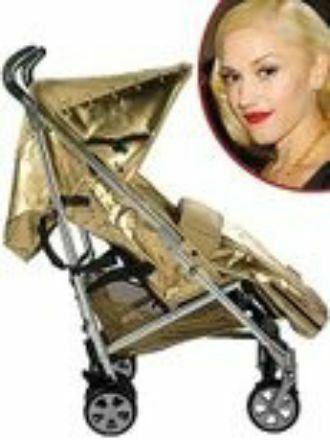 American pop singer Gwen Stefani clearly wants baby Kingston to be the coolest tot in town, with reports that her latest purchase is a gold coloured buggy. According to People Magazine, the glamorous pushchair was seen being paraded around in London this week and was allegedly bought from ultra-trendy British baby shop, Mamas and Papas. People also reports that Gwen was so inspired by the fashionable stroller that she is in talks to create her own product range. Mums wishing to copy Gwen's style are probably going to be out of luck however, since only 10 were made and they cost a cool £453 each. Not to be out-bling-ed, P Diddy has also grabbed one of the golden buggies. Selfridges have offered to get in more stock if there is a demand for them. Kingston Rossdale is the latest arrival into the bling babies club; other kids leading the way in the Hollywood fashion world include Sarah Jessica Parker's son James Wilkie with his trendy shoes; daughter of TomKat, Suri Cruise with her "My mom rocks!" tops; and Brangelina's son Maddox Jolie-Pitt with his blue British bulldog T-shirts.